Summary: To derive a more rigorous determination of clutch frequency, it is now possible to use satellite tags to evaluate how many nests a female may deposit within a season. The methods require that females be instrumented early in the nesting season and followed through the reminder of all internesting intervals until a final nest and then a post-reproductive migration. 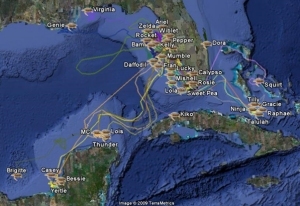 Apart from the study on Casey Key that targets early nesters, other satellite tracking studies on Florida loggerheads have applied tags at the end of the nesting season (July-August) and would therefore provide underestimates of annual fecundity. This second year of study proposes to determine clutch frequency of loggerheads at the two primary nesting beaches for loggerheads in the Gulf of Mexico. Satellite tags as well as standard Inconel flipper tags and PIT tags will be attached to nesting female loggerheads at either Casey Key or Manasota Key during May. Females will be tracked through the remainder of the nesting season to determine clutch frequency and site fidelity. Other valuable research byproducts related to conservation will be the determination of internesting movement, nest site fidelity, exposures levels to red tide, and other risks faced during the internesting and post-nesting movements. By deploying tags early in May, a more accurate determination of clutch frequency will be obtained. The methodological approaches are suited to any of Florida's rookeries so will provide data that are broadly representative for the loggerheads of peninsular Florida, but are ideally suited to beaches that also conduct simultaneous night time tag patrols, such as occur on Manasota and Casey.